The Spalding County Sportsman Club was formed in the 1950s and the group hunted and fished together. In the late 1960s the club started having bass tournaments and these rules were started from club rules at the time. No input from the Bass Angler Sportsman Society was used, unlike the Flint River Bass Club rules Those rules were developed from BASS. These rules have developed over the years and have served the club well. A. Tournament committee shall be comprised of the executive officers and the top six fishermen. This committee shall make all new rules and will rule on all decisions. Its decisions shall be final in all tournament matters. B. The tournament committee shall plan the dates and locations of all tournaments. This committee reserves the right to change the date and location of any tournament. The schedule will be presented for a vote by the club membership at the January meeting each year. After adoption, the schedule can only be changed by following the rule for a by-law change. Tournaments can be canceled by the tournament director due to dangerous conditions. NO canceled tournament will be rescheduled. C. Recorder shall be the same as the club tournament director. Duties shall consist of keeping complete tournament records and enforcing tournament rules. D. Tournament director will receive and distribute any tournament money. E. Inspection officers shall be appointed by the president and the tournament director. Duties shall be enforcing all rules set forth by the tournament committee, including random live well checks. F. The weigher shall be appointed by the president and the tournament director with approval of the tournament committee. Duties shall be maintaining the club scales and conducting the weigh-ins for all tournaments. G. Scorers shall consist of the weigher, the recorder, and one or more assistants appointed by them. H. Each tournament officer shall appoint an alternate if unable to perform his duties. A. Former members in good standing of the Spalding County Sportsman Club must pay dues at least one meeting prior to his first tournament during the calendar year. B. Former members in good standing must pay dues by March meeting or attend a meeting prior to fishing a tournament. C. Each tournament shall have an entrance fee determined by the tournament committee prior to the first tournament. The entrance fee shall be $25.00 until changed. A. All participants shall leave from a designated starting point and return to the same point for weigh-in. B. Participant shall not be allowed to fish with a nonmember except a member may bring a guest to a tournament. The guest may fish only one tournament a year and will pay all entry fees and be eligible for all tournament winnings. They may participate in the tournament big fish pot but may not participate in the cumulative big fish pot. Guest will not receive any points for the tournament they fish. C. Roll call will be taken preceding each tournament by the president and /or tournament director. Any participant missing his name at roll call shall be considered late. Any late participant must find another participating member (A club member who was on time) who will check his livewell fish and collect his entrance fee before the late member is allowed to start fishing . Failure to do so will mean disqualification. D. Penalty for late arrival for weigh-in shall be 3% per minute up to 15 minutes late. Later arrival will call for disqualification. E. Only artificial lures may be used. No live bait is permitted. All fish must be caught live and in a conventional sporting manner. F. Scoring shall be determined by pounds and ounces. Tournament winners shall be determined by accumulated weight for entire tournament. 25 points shall be awarded for the largest total weight in each tournament, 24 for second, down to one point for 25th place. No points shall be awarded unless the participant has weighed at least one fish. One additional point will be awarded to anyone catching a daily limit of bass (5 except in three club tournament, 7 in it). Also , 1 additional point will be give for the largest bass caught in each tournament and 1 point for each club meeting, and 1 point for each tournament attended. G. There will be one division and we will pay the top four places. 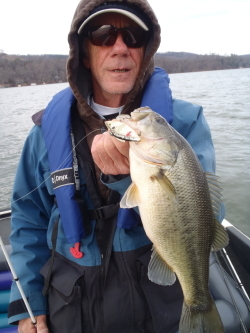 H. Only black bass; largemouth , spotted, red eye or smallmouth bass will be weighed. Five bass per day is the limit. Each contestant must present his own catch at weigh-in if possible. A bass will not be counted or weighed that is not at least 12 inches in length, and all bass must meet state requirements for the lake being fished. Length of a bass will be determined by measurement of the bass with the mouth closed an one tip of the tail touching. The tail will be smoothed down and pinched together As a penalty, a contestant with short fish will have one pound weight deducted for each short bass. This shall apply to both days of a two day tournament. If a short bass is weighed in the first day and the contestant has no other fish, the pound penalty shall be deducted on the second day. Any contestant weighing in more than 5 fish will have his bass culled down to the limit by culling the largest bass first. All fish taken out of the boat will be weighed in. Any bass that appears to be mangled, mashed or mauled will be measured and credited only the discretion of the weighing officials. I. The tournament committee reserves the right to change or postpone any tournament. However, no tournament shall be postponed once it starts. J. Weigh-ins. In case of unavoidable delays, catches must be brought to the weighing station by a fellow member and registered as the delayed members catch and reason for the delay shall be given to the recorder. K. Any member in good standing missing a tournament because he is representing the club in a Federation Tournament shall be given his average points for the present years tournaments. A. Total prize for each tournament shall be set at a fixed percentage of the money taken in for each tournament. The percentages are 1st – 40%, 2nd – 30%, 3rd – 20%, 4th – 10%. B. Fifty dollars of all entrance fees shall be placed in the club treasury before any prizes are given out. This money will be used to promote the club and its activities. Examples: Patches for each member, scrapbook of tournaments, pictures, slides, film and film processing, entrance fees for members attending federation tournament and jackets for the top six members representing the club at federation tournaments. C. Trophies or plaques shall be given to the top six and for the largest fish for the year. These places will be based on total number of points for the year. All tournaments will count in the point standing. A. Any situation not covered by these rules and regulations shall be ruled upon by the tournament committee but may be appealed to the club at large. This entry was posted in Bass Fishing, Tournament Fishing on January 4, 2019 by ronniegarrison.